I’m sure by now you have seen runners running through your neighborhood or local race with bright and colorful knee-high socks on. If your like some of the people whom I know, you may think that its simply a fashion statement, and not a very good one at that. Maybe what you need is a little background information. Compression socks have been used in the medical field to alleviate symptoms of diabetes and to increase blood flow in to the arms and legs by constricting the muscles and holding everything tight. In the past 5 years or so though, athletes have turned to this type of support to help in training and recovery. There really is no real scientific proof that they do work, but I have noticed a decrease in recovery time whenever I use them. With that said I was open to trying out another pair when I came across Pro Compression. After receiving the socks, I used them through different aspects of running; training and recovery. Each time I used them my legs felt significantly better than days when I hadn’t used anything in similar scenarios. The Color – Maybe color shouldn’t be the first thing that I mention that I like, but I already stated that they do work. The second most important factor is style. The website has so many colors and style options. That’s always a plus. I really liked the purplicious pair I received. Ribbing- This is the first pair of compression socks that I have seen with ribbing. It gives them a nice texture and seems to make them tighter. Too Tight – The whole point of the sock is to be tight, but I shouldn’t have elastic indents on the back of my calf after just 30 minutes of wearing them. That doesn’t feel too good. I do have big calf muscles, but as I recall, the sizing depends on the size of your foot, not the width of your legs. Too Hard to Get On – Once again, I know they have to be tight, that is not the problem. It was very hard to get my foot in the socks, and to take them off. In addition to my large calves, I also have big feet. The actual size of the sock was perfect, so that was not as issue. Aside from that the socks did exactly what they were meant to do. I definitely noticed an improvement in the way my legs felt during and after my runs. What to try your own pair?? 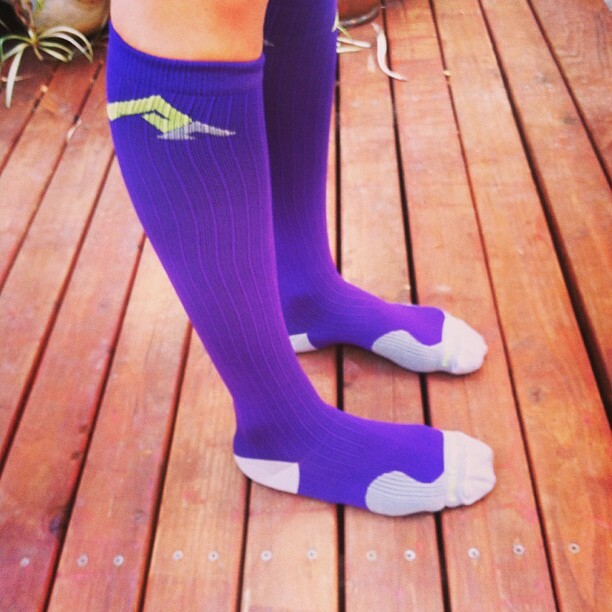 Pro Compression is giving away a pair of compression socks to one very lucky reader! To enter the giveaway, become a follower of Chronicles of Kate. 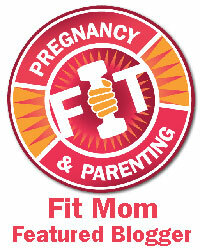 You can earn more entries by sharing this post on Facebook, Twitter, Pinterest, or any other site. Leave a comment and let me know how you entered! 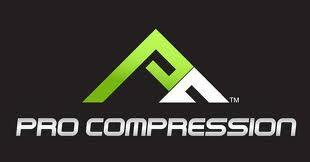 Pro Compression is also offering 40% off online with coupon code BLG13 valid until 10/31!! ← Happy One Year ! Hi Kate, great review on compression socks. Just a thought that may help you in case you have not tried this. Medical compression socks are put on and taken off by rolling them. First you roll them down to a donut shape down by the foot of the sock, grab hold of the rolled up donut shape in both hands, wriggle your foot securely into the foot of the sock then just unroll them up your leg. To remove, naturally you reverse everything. 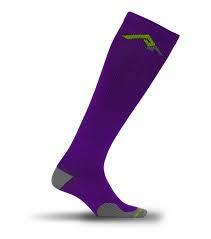 True compression socks are woven in a true leg and foot shape and fit very snug. These pictured like that. Yours will no doubt get a bit looser with wearing and laundry. They (your purple ones) look pretty cool. So, hope this helps some!! Thanks for the info Adrienne. I will definitely try it out! I follow Chronicles of Kate, please enter me in this most excellent drawing! I also shared your review on Facebook, Twitter, and Pinterest. Did you receive my reply to your email that told me I had won a pair of compression socks? Please let me know – I have not received the socks yet. Thanks!